Everyone has a recipe that reminds them of growing up. For me, it's Deluxe Macaroni & Cheese. This is my great-grandmother's recipe, and it is a staple in my family for every major holiday. This Easter we didn't get to go to Texas, but this dish brought me a little closer to home. Nobody makes it quite like Nana, but I give it my best shot and Parker loves it. Parker's parents were in town a couple of weeks ago and we were talking about what we would want our last meal on Earth to be. Without hesitation, I said Deluxe Mac & Cheese. It's that good! 1. Preheat oven to 350 and grease a 9x13 casserole dish. 2. Cook macaroni and drain. 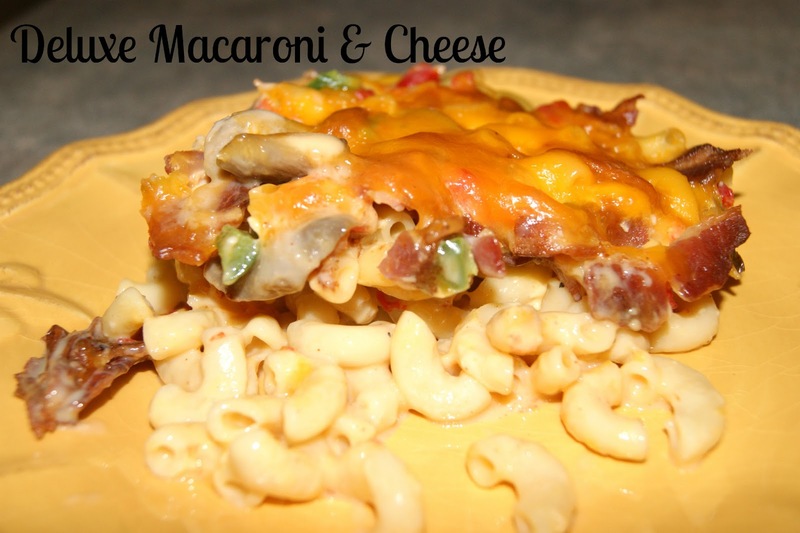 Pour macaroni into greased casserole dish along with butter. Stir butter into pasta until melted. 3. In the top of a double boiler or a medium pot over medium heat, combine Velveeta cheese and milk. Cook until cheese melts. Be sure to stir continuously so cheese does not burn. 5. Bake for about 30 minutes or until cheese is bubbly. Serve and enjoy! Yum!! You're an awesome cook! Well oh my little word. This looks amazing. Thanks so much for sharing with us!! Another great post! Thanks for linking up!